The 48 hour roundtrip from Pennsylvania to Calgary, AB was exciting and made for a good story, but now some details about the trailer. 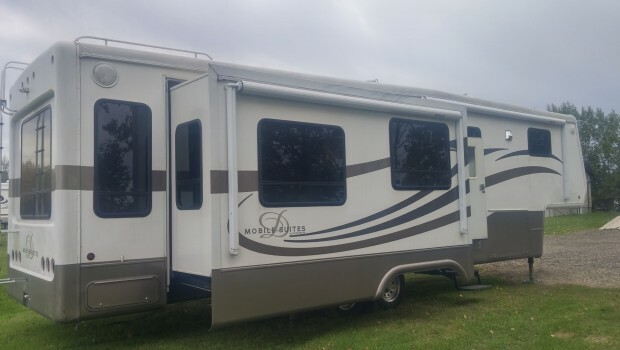 As Betsy said in the last post, we purchased a 2005 DRV Mobile Suites 38RL3. At this point some people may be saying, Heh? Tell me more about the trip!But to us it had a lot of things we felt were important to make it our “Home”. Our home on wheels that would usher us around the country safely, for a long time, and provide us many of the comforts of home. 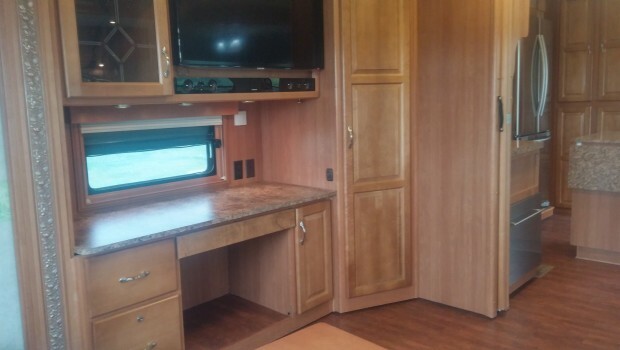 It doesn’t take much reading on the internet about well-built full-time trailers before hearing the name Doubletree Recreation Vehicles (DRV) Mobile Suites. DRV was founded in 2003, and has been consistently building “homes” that meet its’ customers demands ever since. Every sturdy home starts with a great foundation, and this premise doesn’t change when your home is on wheels. The trailer starts with a 15 inch frame and R27 floor insulation. The walls are 3 1/4 inch R13 wall framing and the ceiling is R23, for great insulation all around. True double pane insulated windows finish off this well protected shell of the trailer. The Kitchen - This is where a large portion of the upgrades were made and definitely caught Betsy’s attention. (Did we mention earlier that Betsy owned a cupcake bakery and in her spare time loves to cook?) A rebuild of the kitchen cabinets allowed for a Samsung french-door residential refrigerator, a Verona residential gas cooktop and range, a GE convection/microwave, and a small Vesta dishwasher. Not in the kitchen, but another appliance was a Splendide washer/dryer combo in the bedroom. Electrical Upgrades - The heart of the electrical upgrades is the Magnum Pure Sine 3000 watt power inverter. This helps manage the power stored in the ten 6v batteries neatly placed in the generator compartment in the front of the trailer. (More on the alternative to the onboard generator in a later post.) Also installed was a Progressive Industries surge protector/power management system. I don’t currently claim to know everything about these systems, but I look forward to learning about them and it sure lays a nice groundwork for the installation of solar panels down the road. Yes, Betsy and I look forward to joining the world of Boondocking in the future. If you are already experienced in the world of Boondocking, feel free to send us your favorite spot(s) and we will ad them to our wish list of places. Roof and Tires - Also in 2012, a couple of other important items were updated on this unit. A new roof was installed, providing a little sense of security for a an item that would have been approaching 10 years old. In addition, tires were upgraded to arguably the best choice out there today, 17.5 inch Good Year G114’s. For this weight of trailer (approaching 21,000 lbs. ), these are the tires of choice for most RV’ers. This post may have seemed a little dry or too technical for some, but thanks for getting through it with me. I just wanted to share a little bit about our new home and why we chose the one we did. Hopefully these few pictures, lighten the words up a bit!